It was not possible to paint or draw openly in the streets of the Ghetto of Łódź. Therefore, like other artists, Lejzerowicz based many of his drawings on photographs. There are a number of examples of this in drawings at Yad Vashem and the Jewish Historical Institute, Warsaw. The example above is more complicated. 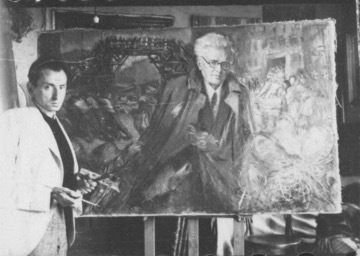 The image at the top shows Lejzerowicz at work on a major painting, “Chaim Rumkowski in the Ghetto of Lodz,” which has survived in the Jewish Historical Institute. The lower photograph shows Lejzerowicz near the bridge at the church square (Plac Kościelny). The angle of the bridge in the painting is precisely that shown in the photograph. The artist used the photograph to guide his work. Both photographs are likely the work of Mendel Grosman, who worked for the ghetto’s Statistical Department. 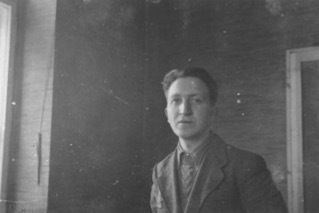 In documenting life in the ghetto, Lejzerowicz seems to have used many photographs by Grosman, who, according to the US Holocaust Memorial Museum, had studied painting with Hirsch Szylis (another painter active in the ghetto) before becoming a photographer. Privately, Grosman documented daily life in the ghetto while also serving as one of the ghetto administration’s official photographers. 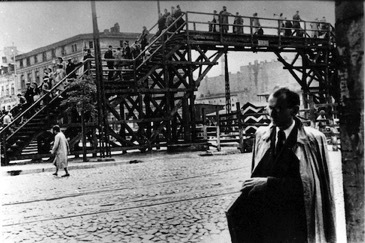 Hundreds of these photographs have survived in the state archives in Łódź and can be seen online at Yad Vashem photo archives. Grosman did not survive the war. Mendel Grosman, likely taken in the offices of the Statistical Department of the ghetto.